In case you haven’t heard, ukuleles are all the rage these days. They are super popular with singer-songwriters, and we’ve had so many of our students spark an interest in learning how to play. We’ve always loved the uke, but their popularity surge inspired us to create a class for beginning strummers. We’ve offered the class several times now, and we’re excited to start a new session in a couple weeks! The goal of 1-2-3, Learn Ukulele is to have students (many of whom have never picked up a stringed instrument) playing chords and then songs right from the get-go. Just recently, one of our students who had never formed a ukulele chord walked out of her first lesson able to play the entirety of “Somewhere Over the Rainbow”! While not everyone learns at quite that speed, the ukulele is easier to pick up than the guitar. It only has 4 strings as opposed to 6, and its petite size fits smaller hands better. What I love most about the ukulele is that the simplest chord progressions and songs perfectly suit its sweet sound; I think that’s why it has become so popular. You don’t have to be highly skilled to play, though there are certainly uke prodigies out there. If your child is interested in playing a fun starter instrument, consider the ukulele! Our 8-week class begins on April 13, and we provide the ukes so that the only thing students need to participate is the willingness to learn. Click here for details and registration. We regularly get asked by the parents in our Listen & Learn for Little Ones classes if an older sibling can sit in on the class. We don’t have a problem with them joining but I often feel bad because the session is geared toward a younger audience. The older siblings will sometimes join in with the instrument playing or helping their little brother/sister, but their needs aren’t the focus in the Little Ones class. So what better way to address those needs than to add a class just for the older siblings at the same time. This session we are adding a Little Ones class on Thursday evening at the same time as the Explorer Class so both young children and older children have a class designed for them but parents only have to worry about being in one place! We’ve also added a couple classes for older kid and even teens and adults on Wednesdays afternoons/evenings. As we continue to grow, we are looking for new opportunities for all of our community members. If there is a class you would like to see, just let us know! We would love you input. 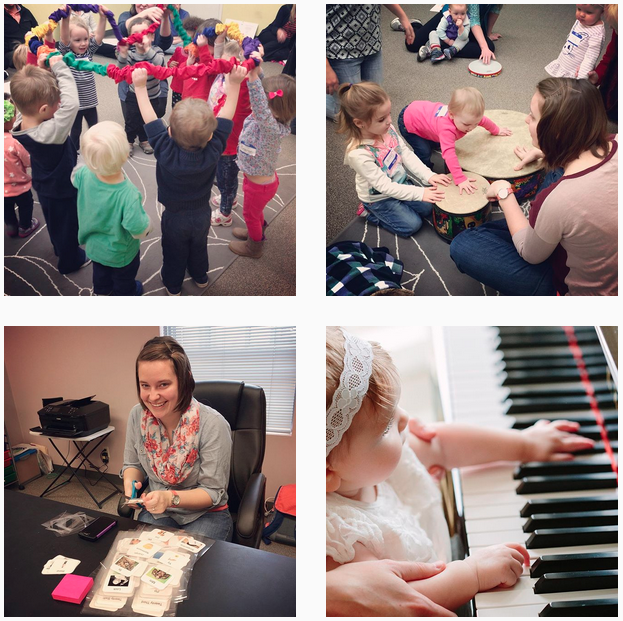 Check out what’s new on our classes page! We’d love to see you in the upcoming session! We took a GIANT step in putting ourselves out there when we opened up our own studio this past summer. Our name is on a sign that is visible from a busy road, which has been wonderful for business. Yes, it’s a giant step, but only the first of many. As our business and team have grown, we’ve started stepping up our game in terms of building a community presence. Just recently, we hosted a booth at a huge local event called KidsFest. We met hundreds of families and helped children make their own egg shakers in addition to networking with other local businesses. We’re sponsoring another event in a few weeks, where we hope to make new contacts and educate even more people about music therapy. Putting yourself out there can be challenging, time consuming, and draining. There’s a lot of prep involved, from designing and printing marketing materials, to standing on your feet for hours at a time, to dedicating evenings and weekends that you’d probably prefer to spend with your family. But we’re already seeing our hard work pay off in terms of new students and clients, as well as recognition from people who have already heard of us. We’re not a household name in Springfield just yet, but we’re steadily taking steps towards that goal. Develop quality print materials. We make our own business cards, brochures and fliers fairly inexpensively by using software like Pages and Microsoft Word and then having them printed locally. Participate in local fairs, exhibitions, and community events. Get yourself a sign or banner (we ordered ours for less that $100 from Vistaprint) and register for your first booth, if you haven’t already. Doing so is usually affordable, depending on the size of the event, and sometimes you can even snag a small business discount. Collect info from people you meet. Giving out fliers and business cards can be effective, but more often than not, they are tossed aside or lost. Have an email list signup or registration form handy so you don’t miss out on a potential new client or student. Host your own events. Last summer, we organized a Midsummer Music Celebration and invited the community via mail and social media. Not only did we have a blast, but we recruited quite a few new families! Of course, don’t try to do everything at once; take your time, experiment, and see what works the best for your business. We are having fun doing that ourselves — it’s a learning experience, for sure! This week has been filled with goodbyes and what we call “closure”. I never anticipated how incredibly challenging this was going to be. My experiences of closure up to this point has been limited to a three month treatment period. Where I would, at the end of my practicum experience, say goodbye to my clients and tell them that our time had unfortunately come to an end. Then, I was focused on my clients and their acceptance of my services being terminated. This has been nothing like that. I have spent six months with the same students and clients. They are all special to me in their own way. Saying goodbye to them and allowing them to transition back to their prior therapists has been more challenging than I could have anticipated. I am finding that even though I am excited for my own professional experience to begin, I will miss spending time with these clients every week. It is the end of a period in my life dense with growth and excitement. As I transition into the next phase of my life I am looking forward to what’s ahead and grateful to have been blessed with such a wonderful internship. There is only one last step to becoming a board certified music therapist: the exam. One of the pieces of advice I’ve heard over and over from business owners is to have set hours for yourself and shut everything off after a certain time. While this may be great advice for some, it doesn’t always work for me. I believe more in listening to what your body and brain are telling you and following your own personal work flow. Instead of pushing myself to do the same tasks at the same time every day or follow my planned out to-do list to the T, I listen to what my body is telling me I should do. I find that by following my own personal flow and doing something I’m drawn to at that moment, I’m able to be more productive, creative, and focused. Also, if I’m working on something I WANT to do, the work usually turns out 10x better than if I’m forcing myself to get it done. Example: The other night, I was wrapping up with students and as everyone was going home when I got the urge to put down one of the tracks for our upcoming session. I was drawn to it and loved doing it! An hour later, I had one of my songs done and loved the way it turned out, even though it was past normal working hours. I worked on a project that drew me in and it was so much easier to get done that way. This method also means listening to my body when it wants to do nothing. Taking a break is not just ok, but necessary. If you need permission to sit on your behind and turn on Grey’s Anatomy, take a long bath, go for a walk, or curl up and take a cat nap, I’m giving it to you now!! DO IT! And don’t give yourself one ounce of guilt. I’ll be the first to admit, there are a couple flaws in my method and a couple drawbacks, but I’ve never felt better, been happier, or produced better work than the days where I am 100% honest with myself and followed what I am inspired to do. Bills have to be paid and calls have to be made – Save or schedule these (or other unpleasant tasks) for when you usually feel best in your day and are free of other distractions. That way you can accomplish them quickly without getting too frustrated or exhausted. Deadlines – We all have them in one sense or another. If you have control over when deadlines are, be realistic with yourself and give yourself plenty of time to accomplish what you need with some extra time thrown in there for those days when projects are a little harder. If you don’t have control, find your flow and run with it. If something isn’t working out, switch tasks and come back to it. Required or scheduled tasks – We all have parts of our day or tasks that we are required to do. Try to keep a positive attitude, get plenty of sleep, surround yourself with positive people and energy, and make it yours. If you don’t like cooking every night, try cooking all your meals one day a week. Paper work got you down? Listen to your favorite tunes. Take a break and walk. Grab your favorite beverage. Sit in your favorite spot. Use fun colored pens. Etc. The moral of the story is, do what works for YOU!! Take the time to figure out what your work flow and follow that. You do you!